October 31, 2018 by Intelligent Technologies, Inc.
One benefit of using cloud software is the ability to get regular, hassle-free upgrades. Acumatica is no exception. Its devoted development team constantly works to improve the software. Twice a year, they release a new version with lots of new features and updates all designed to help the user get the greatest bang for their buck. Acumatica 2018 R2 is the latest in a long line of impressive releases from the popular software company. Its new features cover everything from finance and inventory enhancements to user interface refinements designed to make the software easier to use, no matter what your role. In today’s blog, I want to focus on the latter, system wide features meant to make every user’s job easier. This one is especially helpful for administrators. The new resource usage dashboard makes it easy to keep a close eye on your system’s health and performance. At a glance, you can see exactly how much memory and CPU resources are being consumed. You can also see what processes are running and who is logged in. If you run into a performance issue or want to check and make sure things are running smoothly, look here first. 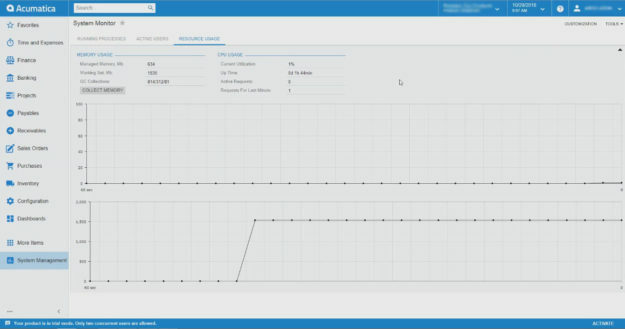 The screenshot below gives an example of what your system monitor dashboard in Acumatica 2018 R2 looks like. This one is simple. But, can save you a lot of time if you need to manage several branches or subsidiaries with a single system. With the release of Acumatica 2018 R2, users who need to work in more than one company can easily switch between the entities by clicking on the drop-down list in Acumatica’s main menu. See screenshot. Clicking on this drop-down menu will reveal a list of all the companies you have access to. Switching from one to another is as simple as clicking the correct name in the drop-down menu. No more wasting time and effort logging out of one company only to refresh your web page to log back into another. Another simple but useful addition to Acumatica 2018 R2 is the welcome screen. Designed for users who don't use dashboards or haven't set them up yet, the welcome screen delivers fast access to a variety of helpful tools like online training, the customer portal, Acumatica news, and a lot more. See screenshot below. 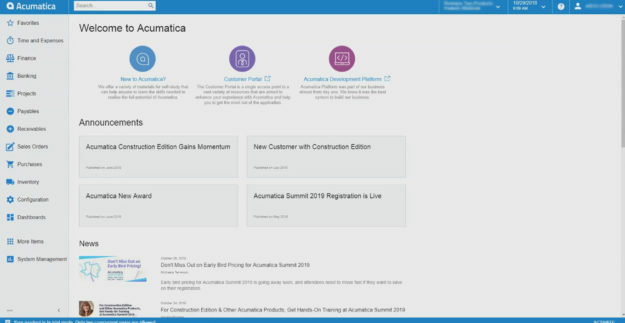 Now, whenever you log into Acumatica 2018 R2 and have a question about how to do something in the system, you will never have to waste time searching for training and documentation links. They’ll be right there, ready for you. With side panels in Acumatica 2018 R2, it’s easier than ever to see all the information you need on a single screen. These are especially useful when you’re looking at a generic inquiry but want to drill into the records behind the report. No more navigating between records or having to open multiple browser windows. Instead, side panels show the relevant information on the right side of your screen. Voila! 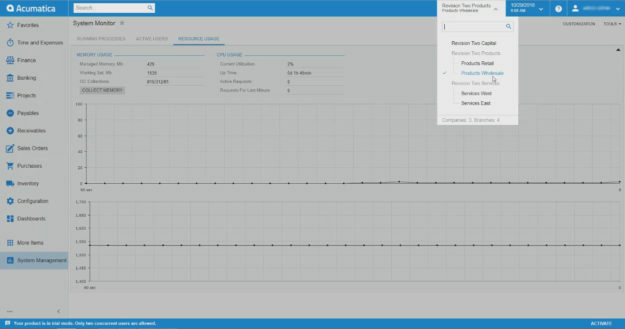 Say hello to at a glance analysis. See screenshot. There you have it, four of the latest features added to Acumatica to make the user’s job just a little easier. This is just scratching the surface of what Acumatica 2018 R2 offers. To learn more, check out this collection of blog posts published by Acumatica. Want to find out if Acumatica is a good fit for your business needs? Contact us today! Our ERP experts have more than 25 years’ experience matching businesses of all shapes and sizes with the technology they need to succeed. Gain Control of Your Critical Data. Cloud ERP to the Rescue!